In my attempt to understand the EPA’s methodology for calculating ENERGY STAR building benchmarking scores I have frequently requested specific information from the EPA. Early on I found the EPA to be reluctant to share anything with me that was not already publicly released by the agency. Dissatisfied with this lack of transparency I decided to formally request information from the EPA through the Freedom of Information Act (FOIA) process. I filed my first FOIA request in March of 2013. I have since filed about 30 such requests. The Freedom of Information Act requires that a Federal agency respond to such requests within 20 working days. If the Agency fails to comply you can file a law suit with the Federal Courts and be virtually guaranteed a summary judgement ordering the Agency to release the requested documents. Of course the courts move at a snail’s pace so you cannot expect this process to produce documents anytime soon, or even to get the courts to take action in a rapid time frame. The EPA keeps track of its statistics at addressing FOIA requests. It has devised two tracks for such requests, a Simple Track and a Complex Track in which requests are sorted. EPA policy is to make every attempt to respond to simple FOIA requests within the statutory 20 day time frame. Complex FOIA requests take longer time to locate documents and process them for public release. For instance, if you request all of Hillary Clinton’s emails it will take time to locate them and to eliminate any portions that might be classified. The EPA has also adopted a first in-first out policy for processing FOIA requests from a particular requester. So, if I already have a complex FOIA request in the queue and I file a second, complex FOIA request, it is the EPA’s policy to complete processing of the first request before turning to the second request. The same policy applies to any requests in the Simple Track. But it is EPA policy to treat these two tracks independently. Meaning that if I have a pending FOIA request in the Complex Track queue and subsequently file a Simple FOIA request, the EPA’s policy is to work on these two requests in parallel. That is, it will not hold up a Simple FOIA request in order to complete a Complex request that was filed earlier. I have a Complex FOIA request with the EPA that has been outstanding for nearly two years. I have no expectation that the EPA will respond to this request unless I seek assistance from the courts. They are simply intransigent. This action, combined with the EPA’s first in-first out policy means that the EPA will not process any other complex FOIA requests from me unless I get the courts involved. On August 9, 2015 I filed a FOIA request with the EPA to provide me with copies of 11 documents that summarize the development and revision of the EPA’s Senior Care Facility ENERGY STAR building model. I know these documents exist because earlier I received an EPA document entitled, “ENERGY STAR Senior Care Energy Performance Scale Development,” an EPA document that serves as a Table of Contents for documents associated with the development of this model. This request requires no searching as the requested documents are specifically identified, readily available, and cannot possibly raise national security issues. Yet the EPA placed this request in its “Complex Track” and provided no response to me for more than 20 days. On September 14, 2015, having received no response I filed what is called an “Administrative Appeal” to ask the Office of General Counsel to intercede to force the agency to produce the requested documents. In my appeal I pointed out that my FOIA request was, by very definition, simple, and thus EPA policy required the Agency to act on this request within the 20 day statuatory period. By Law the EPA has 20 working days to decide an Administrative Appeal. On Friday, October 30, 2015 the EPA rendered a ruling on my Administrative Appeal. The ruling is simple — the Office of General Counsel directs the Agency, within 20 working days, to respond to my initial request. Think of it, 58 working days (two and a half months) after I filed my initial FOIA request — a request which by law should have been responded to within 20 working days, the EPA has now been told by the Office of General Counsel to respond to my request within 20 working days. What a farse! Last month I presented results of research demonstrating that regressions used by the EPA in 6 of the 9 ENERGY STAR building models based on CBECS data are not reproducible in the larger building stock. What this means is that ENERGY STAR scores built on these regressions are little more than ad hoc scores that have no physical significance. By that I mean the EPA’s 1-100 building benchmarking score ranks a building’s energy efficiency using the EPA’s current rules, rules which are arbitrary and unrelated to any important performance trends found in the U.S. Commercial building stock. Below you will find links to my paper as well as power point slides/audio of my presentation. This last year my student, Gabriel Richman, and I have been devising methods using the R-statistics package to test the validity of the multivariate regressions used by the EPA for their ENERGY STAR building models. We developed computer programs to internally test the validity of regressions for 13 building models and to externally test the validity of 9 building models. The results of our external validation tests were presented at the 2015 International Energy Program Evaluation Conference, August 11-13 in Long Beach, CA. My paper, “Results of validation tests applied to seven ENERGY STAR building models” is available online. The slides for this presentation may be downloaded and the presentation (audio and slides) may be viewed online. The basic premise is this. Anyone can perform a multivariate linear regression on a data set and demonstrate that certain independent variables serve as statistically-significant predictors of a dependent variable which, in the case of EPA building models, is the annual source energy use intensity or EUI. The point in such regressions, however, is not to predict EUI for buildings within this data set — the point is to use the regression to predict EUI for other buildings outside the data set. This is, of course, how the EPA uses its regression models — to score thousands of buildings based on a regression performed on a relatively small subset of buildings. In general there is no a priori reason to believe that such a regression has any predictive value outside the original data on which it is based. Typically one argues that the data used for the regression are representative of a larger population and therefore it is plausible that the trends uncovered by the regression must also be present in that larger population. But this is simply an untested hypothesis. The predictive power must be demonstrated through validation. 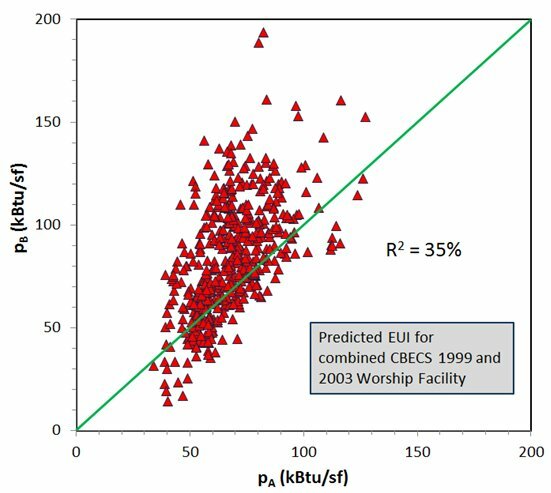 External validation involves finding a second representative data set, independent from the one used to perform the regression, and to demonstrate the accuracy of the original regression in predicting EUI for buildings in this second data set. This is often hard to do because one does not have access to a second, equivalent data set. Because the EIA’s Commercial Building Energy Consumption Survey (CBECS) is not simply a one-time survey, there are other vintages of this survey to supply a second data set for external validation. This is what allowed us to perform external validation for the 9 building models that are based on CBECS data. Results of external validation tests for the two older models were presented at the 2014 ACEEE Summer Study on Energy Use in Buildings and were discussed in a previous blog post. Tests for the 7 additional models are the subject of today’s post and my recent IEPEC paper. If the EUI predicted by the EPA’s regressions are real and reproducible then we would expect that a regression performed on the second data set would yield similar results — that is, similar regression coefficients, similar statistical significance for the independent variables, and would predict similar EUI values when applied to the same buildings (i.e., as compared with the EPA regression). Let the EPA data set be data set A and let our second, equivalent data set be data set B. We will use the regression on data set A to predict EUI for all the buildings in the combined data se, A+B. Call these predictions pA. Now we use the regression on data set B to predict EUI for all these same buildings (data sets A+B) and call these pB. We expect pA = pB for all buildings, or nearly so, anyway. A graph of pB vs pA should be a straight line demonstrating strong correlation. Below is such a graph for the EPA’s Worship Facility model. What we see is there is essentially no similarity between these two predictions, demonstrating the predictions have little validity. This “predicted EUI” is at the heart of the ENERGY STAR score methodology. Without this the ENERGY STAR score would simply be ranking buildings entirely on their source EUI. But the predicted EUI adjusts the rankings based on operating parameters — so that a building that uses above average energy may still be judged more efficient than average if it has above average operating characteristics (long hours, high worker density, etc.). What my research shows is this predicted EUI is not a well-defined number, but instead, depends entirely on the subset of buildings used for the regression. Trends found in one set of buildings are not reproduced in another equally valid set of similar buildings. The process is analogous to using past stock market values to predict future values. You can use all the statistical tools available and argue that your regression is valid — yet when you test these models you find they are no better at picking stock winners than are monkeys. Above I have shown the results for one building type, Worship Facilities. Similar graphs are obtained when this validation test is performed for Warehouses, K-12 Schools, and Supermarkets. My earlier work demonstrated that Medical Office and Residence Hall/Dormitories also failed validation tests. Only the Office model demonstrates strong correlation between the two predicted values pA and pB — and this is only when you remove Banks from the data set. The release of 2012 CBECS data will provide yet another opportunity to externally validate these 9 ENERGY STAR building models. I fully expect to find that the models simply have no predictive power with the 2012 CBECS data. Why does the EPA publish false claims about its Medical Office ENERGY STAR model? To say that someone “lied” is a strong claim. It asserts that not only is the statement false but the person making it knows that the statement is false. the cumulative distribution for this model from which ENERGY STAR scores are derived is said to be fit with a 2-parameter gamma distribution. All of the above statements/descriptions are false. The filters described by the EPA do not produce an 82 record dataset, and the dataset produced do not then have the properties (min, max, and mean) described in Figure 2 of the EPA’s document. And a regression using the EPA’s variables on the dataset obtained using their stated filters do not produce the results listed in Figure 3 of the EPA’s document. In short, this EPA document is a work of fiction. I have published these facts previously in my August 2014 ACEEE paper entitled “ENERGY STAR Building Benchmarking Scores: Good Idea, Bad Science.” Six months ago I sent copies of this paper to EPA staff responsible for the agency’s ENERGY STAR building program. I have given the EPA the opportunity to supply facts supporting their claims by filing three Freedom of Information Act (FOIA) requests, the first (EPA-HQ-2013-00927) for the list of 1999 CBECS ID’s that correspond to their 82-building dataset, and the second (EPA-HQ-2013-009668) for the alpha and beta parameters for the gamma distribution that fits their data, and the third (EPA-HQ-2013-010011) for documents justifying their exclusion of buildings <5000 sf from many models, including Medical Offices. The EPA has closed the first two cases indicating they could not find any documents with the requested information. 17 months after filing the third request it remains open and the EPA has provided no documents pertaining to the Medical Office model. The EPA is publishing claims for which they have no supporting documents and that I have demonstrated are false. The details of my analysis are posted on the web and were referenced in my ACEEE paper. In November 2014 the EPA corrected errors in other Technical Methodology documents yet it saw no need to correct or retract the Medical Office document. Why is it so hard for the EPA to say they messed up? It is common for scientists to correct mistakes by publishing “errata” or even withdrawing a previously published paper. No doubt EPA staff once believed this document they have published was correct. But how is it possible the EPA remained unaware of the errors while it continued to publish and even revise this document for nearly a decade? How can the EPA continue to publish such false information six months after it has been informed of the errors? Is the EPA lying about its Medical Office building model? I cannot say. But it is clear that the EPA either has total disregard for the truth or it is incompetent. If these follks worked for NBC they would have to join Brian Willams on unpaid leave for six months. Apparently the federal government has a lower standard of competence and/or integrity. On January 28, 2015 the District of Columbia published the second year of energy benchmarking data collected from private buildings. This year’s public disclosure applies to all commercial buildings 100,000 sf and larger while last year’s public disclosure was for all buildings 150,000 sf or bigger. Data published are drawn from the EPA’s ENERGY STAR Portfolio Manager and include building details such as gsf and principal building activity along with annual consumption for major fuels (electric, natural gas, steam), water, and calculated green house gas emission (associated with fuels). Also published are annual site EUI (energy use intensity) and weather-normalized source EUI metrics, commonly used to asses building energy use. DC commercial buildings continue to be exceptionally efficient. The median reported ENERGY STAR® score for private commercial buildings in the District was 74 out of 100—well above the national median score of 50. Buildings increased in efficiency from 2012 to 2013. Also, overall site energy use went up by 1.5% among buildings that reported 2012 and 2013 data. However, when accounting for weather impacts and fuel differences, the weather-normalized source energy use for the same set of buildings decreased by 3% in 2013. These claims are simply unjustified. In particular consider the second point — that 2013 source energy used by DC buildings is 3% lower than it was in 2012 — demonstrating improved energy efficiency. This claim is based on weather-normalized source energy numbers produced by the EPA’s Portfolio Manager. The problem is that the EPA lowered its site-to-source energy conversion factor for electricity from 3.34 to 3.14 in July 2013 — a 6% reduction. Because of this simple change, any building that has exactly the same energy purchases for 2013 that it did in 2012 will, according to Portfolio Manager, be using 4-6% less source energy in 2013 (depending on the amount of non-electric energy use). In other words — the District finds its buildings used 3% less source energy in 2013 than in 2012 when, in fact, by doing nothing, all US buildings saved 5-6% in source energy over this same time frame. It is said that “a rising tide lifts all boats.” In this case the Washington DC boat did not rise quite as much as other boats. More seriously, such small differences (1% – 3%) in average site or source energy are not resolvable within the statistical uncertainty of these numbers. The standard deviations of the 2012 and 2013 mean site and source EUI for DC buildings are too large to rule out the possibility that such small changes are simply accidental, rather than reflective of any trend. Scientists would know that. Politicians would not — nor would they care if it makes or a good sound bite. Let me now address the other claim. It may well be true that the median ENERGY STAR score for district buildings is 74. I cannot confirm this – but I have no reason to doubt its veracity. But there are no data to support the assumption that the median ENERGY STAR score for all commecial buildings is 50. All evidence suggests that the national median score is substantially higher — in the 60-70 range, depending on the building type. My recent analysis shows that the science that underpins these ENERGY STAR scores is wanting. ENERGY STAR scores have little or no quantiative value and certainly DO NOT indicate a building’s energy efficiency ranking with respect to its national peer group — despite the EPA’s claims to the contrary. The claim that the median score for US buildings is 50 is similar to making the claim that the median college course grade is a “C.” Imagine your daughter comes home from College and says, “my GPA is 2.8 (C+) which is significantly higher than the (presumed) median grade of 2.0 (C). You should be very proud of my performance.” The problem is the actual median college grade is much closer to 3.3 (B+). Its called grade inflation. Its gone on for so many years that we all know the median grade is not a “C.” Until recently ENERGY STAR scores were mostly secret — so the score inflation was not so apparent. But the publication of ENERGY STAR scores for large numbers of buildings as a result of laws such as those passed in Washington DC has removed the cloak — and the inflation is no longer hidden. ENERGY STAR scores are no more than a “score” in a rating game whose ad hoc rules are set by the EPA in consultation with constituency groups. It seems to have motivational value, and there is nothing wrong with building owners voluntarily agreeing to play this game. But like fantasy football, it is not to be confused with the real game. A few weeks ago NYC released Energy Benchmarking data for something like 15,000 buildings for 2013. 9500 of these buildings are classified as “Multifamily Housing” — the dominant property type for commercial buildings in NYC. While data from Multifamily Housing buildings were released by NYC last year, none included an ENERGY STAR building rating as the EPA had not yet developed a model for this type of building. But a few months ago the EPA rolled-out its ENERGY STAR building score for Multifamily Housing. So this latest benchmarking disclosure from NYC includes ENERGY STAR scores for 876 buildings of this type. 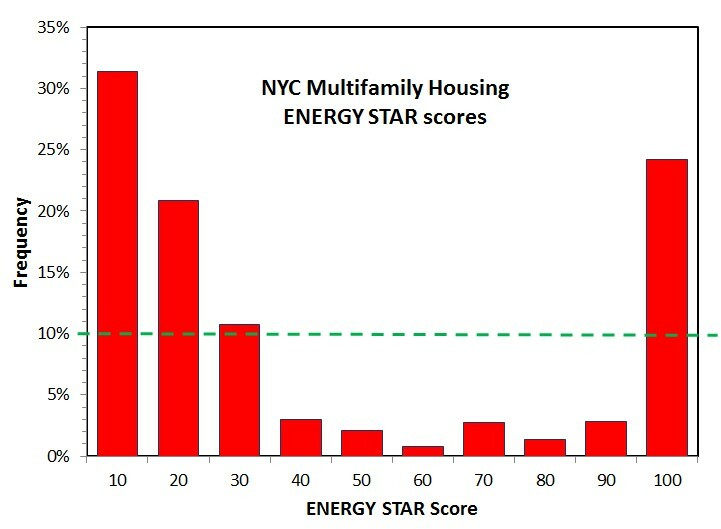 (Apparently the vast majority of NYC’s multifamily buildings did not qualify to receive an ENERGY STAR score — probably because the appropriate parameters were not entered into Portfolio Manager.) Scores span the full range, some being as low as 1 and others as high as 100. But are these scores meaningful? Most of the above 10 models I analyzed were based on public data obtained from the EIA’s Commercial Building Energy Consumption Survey (CBECS). Because these data were publicly available these models could be replicated. One of the models (Senior Care Facilities) was based on voluntary data gathered by a private trade organization — data that were not publicly available. I was able to obtain these data through a Freedom of Information Act (FOIA) request and, once obtained, confirmed that this model was also not based on good science. Like the Senior Care Facility model, the EPA’s Multifamily Housing ENERGY STAR model is constructed on private data not open to public scrutiny. These data were gathered by Fannie Mae. It is my understanding that a public version of these data will become available in January 2015. Perhaps then I will be able to replicate the EPA’s model and check its veracity. Based on information the EPA has released regarding the Multifamily ENERGY STAR model I fully expect to find it has no more scientific content than any of the other building models I have investigated. One of the problems encountered when building an ENERGY STAR score on data that are “volunteered” is that they are necessarily skewed. Put more simply, there is no reason to believe that the data submitted voluntarily are representative of the larger building stock. ENERGY STAR scores are supposed to reflect a building’s energy efficiency percentile ranking as compared with similar buildings, nationally. When properly defined, one expects these scores to be uniformly distributed in the national building stock. In other words, if you were to calculate ENERGY STAR scores for thousands of Multifamily Housing Buildings across the nation, you expect 10% of them to be in the top 10% (i.e., scores 91-100), 10% in the lowest 10% (i.e., scores 1-10), and so on. If this is not the case then clearly the scores do not mean what we are told they mean. Meanwhile, it is interesting to look at the distribution of ENERGY STAR scores that were issued for the 900-or-so Multifamily Housing facilities in NYC’s 2013 benchmarking data. A histogram of these scores is shown below. The dashed line shows the expected result — a uniform distribution of ENERGY STAR scores. Instead we see that NYC has far more low and high scores than expected, and relatively fewer scores in the mid-range. 24% of NYC buildings have ENERGY STAR scores ranging from 91-100, more than twice the expected number. And 31% of its buildings have scores 1-10, more than 3X the expected number. Meanwhile only 12% have scores ranging from 41 to 90. We expect 50% of the buildings to have scores in this range. I ascribe to the scientific principal known as Occam’s Razor. This principal basically says that when faced with several competing explanations for the same phenomenon, choose the simplest explanation rather than more complicated ones. The simplest explanation for the above histogram is that these ENERGY STAR scores do not, in fact, represent national percentile rankings at all. The EPA did not have a nationally representative sample of Multifamily Housing buildings on which to build its model, and its attempt to compensate for this failed. Until the EPA provides evidence to the contrary — this is the simplest explanation. I have been spending this week at the American Council for an Energy Efficient Economy’s (ACEEE) Summer Study on Energy Efficiency in Buildings. Yesterday I presented a paper that summarizes my findings from an 18-mos study of the science behind the EPA’s ENERGY STAR building rating systems. There are many problems with these models that cause the ENERGY STAR scores they produce to be both imprecise (i.e. have large random uncertainty in either direction) and inaccurate (i.e., wrong due to a errors in the analysis). The bottom line is that, for each of these models, the ENERGY STAR scores they produce are uncertain by about 35 points! That means there is no statistically significant difference between a score of 50 (the presumed mean for the US commercial building stock) and 75 (an ENERGY STAR certifiable building). It also means that any claims made for energy savings based on these scores are simply unwarranted. The results are summarized by the abstract of my paper, reproduced below. The EPA introduced its ENERGY STAR building rating system 15 years ago. In the intervening years it has not defended its methodology in the peer-reviewed literature nor has it granted access to ENERGY STAR data that would allow outsiders to scrutinize its results or claims. Until recently ENERGY STAR benchmarking remained a confidential and voluntary exercise practiced by relatively few. In the last few years the US Green Building Council has adopted the building ENERGY STAR score for judging energy efficiency in connection with its popular green-building certification programs. Moreover, ten US cities have mandated ENERGY STAR benchmarking for commercial buildings and, in many cases, publicly disclose resulting ENERGY STAR scores. As a result of this new found attention the validity of ENERGY STAR scores and the methodology behind them has elevated relevance. This paper summarizes the author’s 18-month investigation into the science that underpins ENERGY STAR scores for 10 of the 11 conventional building types. Results are based on information from EPA documents, communications with EPA staff and DOE building scientists, and the author’s extensive regression analysis. For all models investigated ENERGY STAR scores are found to be uncertain by ±35 points. The oldest models are shown to be built on unreliable data and newer models (revised or introduced since 2007) are shown to contain serious flaws that lead to erroneous results. For one building type the author demonstrates that random numbers produce a building model with statistical significance exceeding those achieved by five of the EPA building models. In subsequent posts I will elaborate on these various findings. A few months ago Washington DC released its 2012 energy benchmarking data for private commercial buildings 150,000 sf and larger. Credible energy and water consumption data for some 400 buildings were released, of which 246 were office buildings. A recent article — stemming from the web site LEED Exposed — has claimed that these data show LEED buildings use more energy than non-LEED buildings. Specifically it is claimed that LEED buildings have an average weather normalized source EUI of 205 kBtu/sf whereas non-LEED buildings have an average EUI of 199 kBtu/sf. No details are provided to support this claim. My students and I have cross-listed the DC benchmarking data with the USGBC LEED Project directory and identified 94 LEED-certified buildings in the 2012 DC benchmarking dataset — all but one being classified as office buildings. The unweighted mean weather normalized source EUI for these 94 LEED certified buildings is 202 kBtu/sf. The unweighted mean weather normalized source EUI for remaining 305 buildings is 198 kBtu/sf. No doubt this is the basis for the claim that LEED buildings use more energy than non-LEED. However, the difference is not statistically significant. Moreover, the non-LEED dataset, in addition to 154 office buildings, contains 64 (unrefrigerated) warehouses and 90 multifamily housing buildings — all of which use significantly less energy than do office buildings. The comparison of these two average EUI is not useful — just a meaningless sound bite. It should also be noted that the unweighted mean EUI for a collection of buildings is an inappropriate measure of their total energy consumption. The appropriate measure of energy consumption is their gross energy intensity — their total source energy divided by the total gross square footage. This issue has been discussed in several papers [2008 IEPEC; 2009 Energy & Buildings]. Note that an apples-to-apples comparison of energy consumed by one set of buildings to that consumed by another requires that the two sets contain the same kinds of buildings in similar proportions. When possible this is best accomplished by sticking to one specific building type. Since office buildings are far and away the most common in both datasets it makes sense to make an office-to-office comparison — pun intended. 93 of the LEED-certified buildings are offices. But many of these buildings were not certified during the period for which data were collected. Some were certified during 2012 and others were not certified until 2013 or 2014. Only 46 of the office buildings were certified before Jan. 1, 2012 and are then expected to demonstrate energy and GHG emissions savings for 2012. The 2012 gross weather-normalized source energy intensity for the 46 LEED certified office buildings is 191 kBtu/sf. This is 16% lower than the gross weather-normalized source energy intensity for the 154 non-certified office buildings in the dataset, 229 kBtu/sf. These modest savings are real and statistically significant, though much lower than the 30-40% savings routinely claimed by the USGBC. Note that similar savings were not found in 2011 or 2012 NYC energy benchmarking data. Analysis of these data showed that LEED-certified office buildings in NYC used the same amount of primary energy and emitted no less green house gases than did other large NYC office buildings. So the 2012 results from Washington DC are significantly different. It should be noted that NYC office buildings certified at the gold level were found to exhibit similar modest energy savings. Perhaps this is a clue as to why Washington DC LEED buildings show energy savings. More analysis is required. For the last few years the USGBC has pointed to ENERGY STAR scores for LEED certified buildings as evidence of their energy efficiency. While ENERGY STAR scores have two important characteristics — they use source rather than site energy and they are based on actual energy measurements — they simply do not have sound scientific basis. The science has never been vetted, and my own analysis shows these scores are little more than placebos to encourage energy efficiency. They certainly do not have any quantitative value. So to summarize, in 2012 LEED offices in Washington used 16% less source energy than did other office buildings in DC. What this means and whether such savings justify the added costs of LEED are open questions. Professor of Physics at Oberlin College. I was originally trained as a condensed matter experimentalist. In the last 15 years my research has focused on photovoltaic devices, PV arrays, wind energy, energy efficiency, and energy use in buildings.